WRAPPERS COME IN MANY FINELY DISTINGUISHED SHADES OF COLOUR, AND GREAT CARE IS TAKEN TO ENSURE THAT ALL OF THE CIGARS IN ANY ONE BOX ARE THE EXACT SAME SHADE. 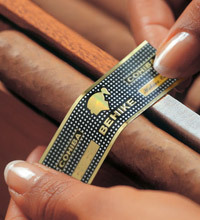 THE ‘BANDER’ DELICATELY APPLIES A BAND TO EACH CIGAR. Cigar bands were introduced in the 1860’s by Don Gustavo Bock, a European who had arrived in Havana to make his fortune in cigars. Legend has it that the idea sprang from a desire to protect the white-gloved fingers of his more refined customers from staining. 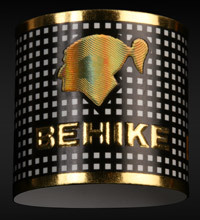 Others explanations suggest that bands were introduced simply to differentiate between cigar brands and to make the production of fakes and imitations more difficult. Whatever the true reason was, cigar bands grew to become the Habano’s most potent popular symbol, prized by collectors and copied by every rival. There are strict quality control tests at all stages of hand making. Cigars that fail will never become Habanos. Technicians check the cigars for weight, length, girth, consistency, construction and appearance. Every factory has its team of cigar tasters who test cigars and score them for draw, burn, aroma, flavour, strength and overall quality.